Can I do Tai Chi? How can I learn Tai Chi? If you are finding it difficult to exercise, then Tai Chi just might be for you. Tai chi has been gradually in popularity world wide and is particularly popular with the elderly, but what is Tai chi? Tai chi is a martial art that uses deep breathing with slow and graceful movements. This can be seen in the picture above, the picture was taken in Macca, Malaysia. I haven't been to Macca but I have been to Kualr Lumpar and Kuching and in both places I've seen people practising Tai Chi daily, it is wonderful to see. 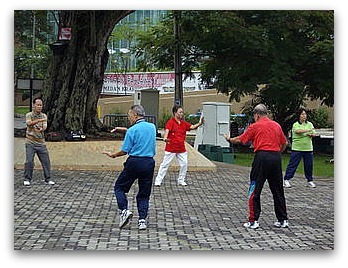 As I mentioned Tai Chi is popular with the elderly, so people of all ages and fitness levels can do it. You don't need to have special equipment to do it. If you are pregnant or in severe pain a lot of the time it would be advisable to see your health care provider first, my own opinion which is not medical I know, is unless you are barely able to move they will be supportive of the idea. The best way to learn Tai Chi would be via a Tai Chi instructor, you can be taught in a class or one to one. They can make sure that you are doing the right postures. If that isn't possible then you can learn using a video or book, it's not ideal but it's better than nothing. Tai Chi benefits people by reducing stress, anxiety, depression and improving their mental health. A systematic review and meta-analysis by Chenchen Wang and other researchers used 3817 people from English and Chinese databases. They conducted observational studies, randomized studies and randomized controlled trials. The trials showed that Tai Chi improved the mental health of people who had stress, anxiety and depression and increased their self esteem. Tai chi can help people with arthritis and improve overall mobility Researchers from Massachusetts tested the effect of Tai Chi on patients with arthritis of the knee. It is a painful condition, I know someone who suffers from it. Their study showed that patients who practised Tai Chi suffered less pain and were more mobile, less depressed and improved their overall health. Another group were asked to practice stretching exercises, the patients also reported an improvement but their pain was reduced by only twenty percent which was not as good as Tai Chi group. A former British Tai Chi champion, called Barry Phelan teaches Tai Chi in Kent,England. I will be adding some more to this page in due course, so stay tuned.